“I always want to try to find different things within myself,” Austin Abrams tells me when I ask about his acting process. In the middle of a hot Sunday afternoon, Abrams and I are on a conference call. At 21, “The Walking Dead” alumnus Abrams faces a career breakthrough with this year’s “Brad’s Status,” now playing nationwide through Annapurna Pictures and Amazon Studios. Writer and director Mike White (the creative voice behind “Nacho Libre” and recent indie smash “Beatriz at Dinner”) steers the drama, which follows the parallel struggles of a father’s midlife crisis and his son’s transition to college during a tour of Ivy League schools. Abrams stars as Troy Sloan, the son of Brad Sloan (Ben Stiller). While Troy experiences the common plights of a college-bound student, Brad begins to crumble under the weight of his own feelings of inadequacy compared to his successful friends: White House worker Craig Fisher (Michael Sheen), tech company owner Billy Wearslter (Jemaine Clement) and hedge fund manager Jason Hatfield (Luke Wilson). During Abrams’ time as a cast member on “The Walking Dead,” his first major role, he spent time in the city of Atlanta. Abrams said that although he enjoyed downtown Atlanta, he was primarily stationed in nearby Peachtree City, Ga., during the shoots, where he would rent out bikes to explore the local areas. For “Brad’s Status,” Abrams said that he took steps to prepare for playing a prospective college student, which included learning about interview processes for rigorous institutions by consulting friends that attended Harvard University (Mass.) (one of the schools to which Troy applies). Though the film chronicles the hardships of the college admissions process, Abrams said that he does not feel that the film criticizes it, citing that he did not believe that that was White’s intention in writing it. Rather, Abrams said, it simply depicts the difficulties of the process for everyone involved. Abrams said that he found his performance’s strength in his personal connection to the character. “I feel like there was a lot to relate to because he’s at a point in his life that I’d been in a couple years ago,” Abrams said, adding that he challenged himself to find deeper connections between his own life and the role, particularly in regard to how his character handles both his decision of where to attend college and his relationship with his father. That relationship is the rock of the film, cemented by Stiller’s soulful work as Brad. Stiller has long been known for his comedic prowess but, like other actors of his status, has quite the untapped reservoir of dramatic chops. 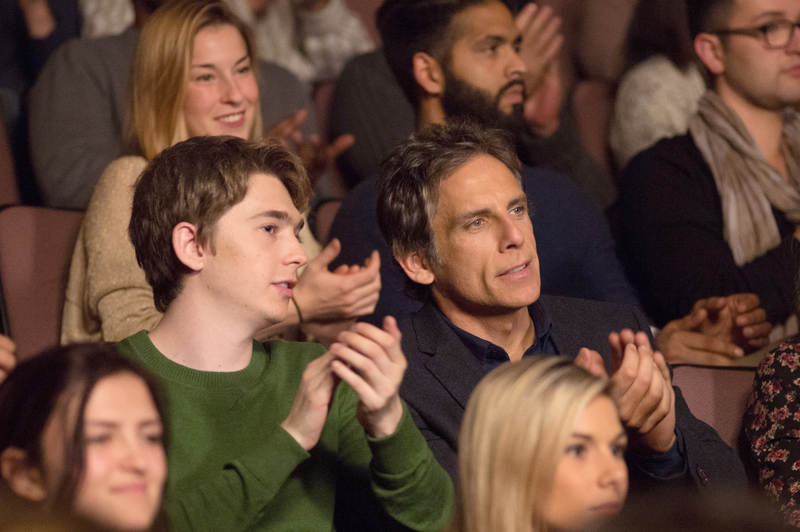 Some would argue that “Brad’s Status” and his recent independent work (including Noah Baumbach’s “While We’re Young”) mark a mature turning point in his career. Abrams said that he could not have asked for a better collaborator on the film than the one he found in Stiller. Though the film marked a major change in tone for Stiller, he brought his practical experience and “overwhelming kindness” to the table and answered any questions Abrams had. Stiller also maintained a fatherly relationship with Abrams on set, according to Abrams. When the Wheel asked what he learned in this role, Abrams reflected on his experience as a whole. Abrams credits Stiller and White for their lessons in filmmaking, citing an instance where Stiller himself contributed the idea for the film’s tickle scene, which is one of its most crucial. With learning this kind of perceptive skill, it is clear that Abrams has a bright future ahead of him as his star continues to rise.